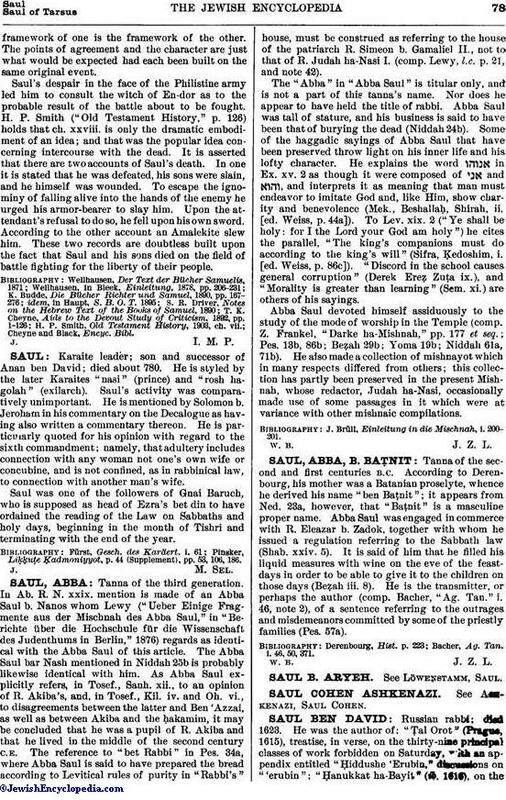 Karaite leader; son and successor of Anan ben David; died about 780. He is styled by the later Karaites "nasi" (prince) and "rosh hagolah" (exilarch). Saul's activity was comparatively unimportant. He is mentioned by Solomon b. Jeroham in his commentary on the Decalogue as having also written a commentary thereon. He is particularly quoted for his opinion with regard to the sixth commandment; namely, that adultery includes connection with any woman not one's own wife or concubine, and is not confined, as in rabbinical law, to connection with another man's wife. Saul was one of the followers of Gnai Baruch, who is supposed as head of Ezra's bet din to have ordained the reading of the Law on Sabbaths and holy days, beginning in the month of Tishri and terminating with the end of the year. Pinsker, Liḳḳuṭe Ḳadmoniyyot, p. 44 (Supplement), pp. 53, 106, 186.